Is your style Farmhouse? Do you love objects that have proven their worth over time, and classic, well made furniture? Do you stick to colors that remind you of history and heritage, and avoid trends as too fleeting? Do you enjoy decorating for the seasons and holidays? In my new book, Bedroom Style, Perfectly Pieced, farmhouse style is one of five featured design styles–and we discuss, you and I, how to give your bedroom a beautiful, timeless Farmhouse look and feel. Farmhouse style is classic and often quite elegant, and can still be current and on trend with the right color combinations and accessories. 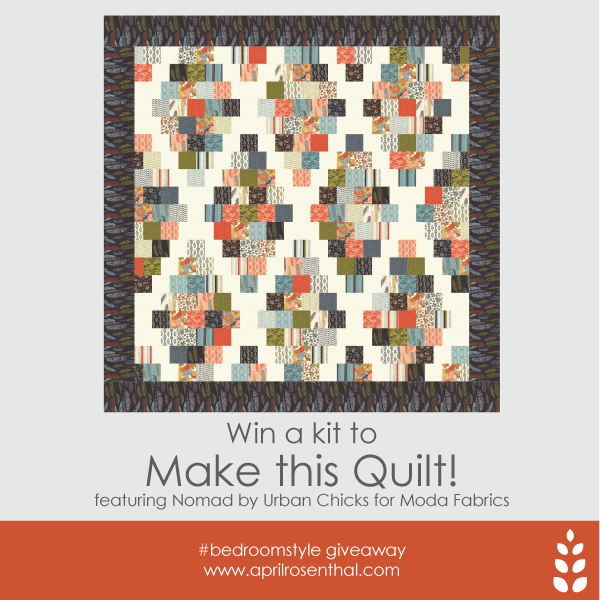 I chose a stunning bundle from Urban Chicks’ upcoming line Nomad for Moda to giveaway this week–so that you can make your very own version of Summer Fields from Bedroom Style. This is one of my favorite quilts in the book, and it’s also one of my favorite fabric bundles in these giveaways. I love the unexpected addition of coral to a very traditional palette of black, dusty aqua, avocado and ecru–it adds a hint of warmth and style to an otherwise cold color grouping. This bundle is sure to make a breathtaking quilt that you’ll need to send me when you finish. :) I’m going to be needing it on my bed. To help you envision what you could do with your bedroom makeover, here are some accessories that fit just perfectly with the Farmhouse style. 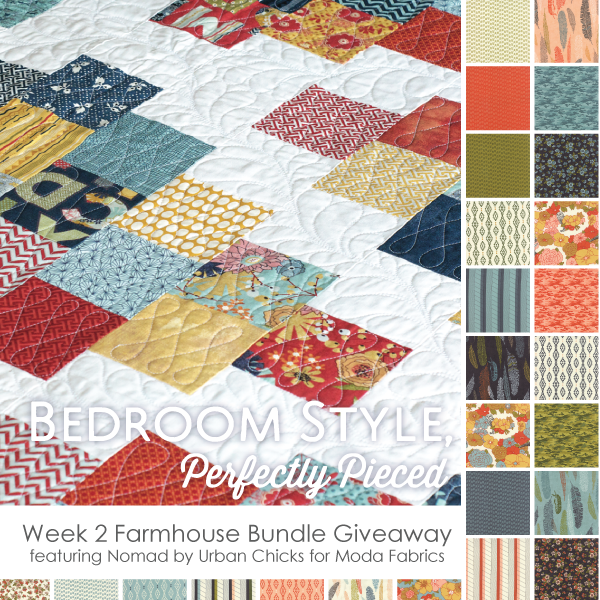 Be sure and get your entry in before this Saturday, January 31st at 12:00 CST to be eligible to win this beautiful Farmhouse quilt kit–AND the $1000 Crate & Barrel Bedroom Makeover! Still need a copy of Bedroom Style? You can order it on Amazon, or snag a signed copy from my shop! PS The winner of the Week 1 Coastal bundle was announced on Saturday, was it you? I am SO a use it and love it person. I am using my grandmother’s bedroom set, that I love, I called it an antique, she only said it was old. (of course she was 90 at the time and I was in my thirties). Until I get the quilt finished for it I am even using her old bedspread, as lavender anything is always a winner for me. What a beautiful story to go with your bedroom set! I’m sure it’s gorgeous! I LOVE Farmhouse! I hope I win. I grew up on a farm in a big old two story farm house and can remember the quilts my grandma made to keep us warm. She had also furnished the house since my mom and dad were newlyweds when they moved in. The furniture was true farm house and wonderful. I also love the coral in the bundle,I think it works perfectly with the other colors. I stick to classic colors and blocks.I like some farmhouse style decorating , such as wooden log beds and amish style quilts. I think that’s my favorite part of styles and decorating–you can choose which things you love, and mix and match! Thanks for commenting! I love the farmhouse style and would be thrilled to win the fabrics! My bedroom really needs a makeover – from drapes to rugs. Quilts, I have plenty of, but there’s always room for one more in the rotation! This looks great. I love the way you combined everything, it’s like living on a Pinterest board! I want your book but shipping to canada is the same price as the book!! I just bought it? 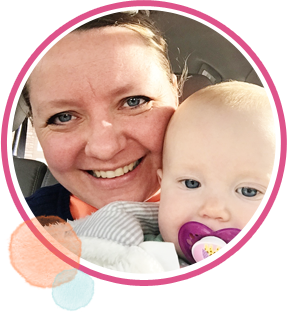 I am so excited to be apart in the big give away. We just renovated 90% of our home and ran out of money to do the master. This would be awesome to get this! By the way, what type of longarm do you have? I used to have an apqs but am open to options and am interested in your opinion. What great colors!! I love them. 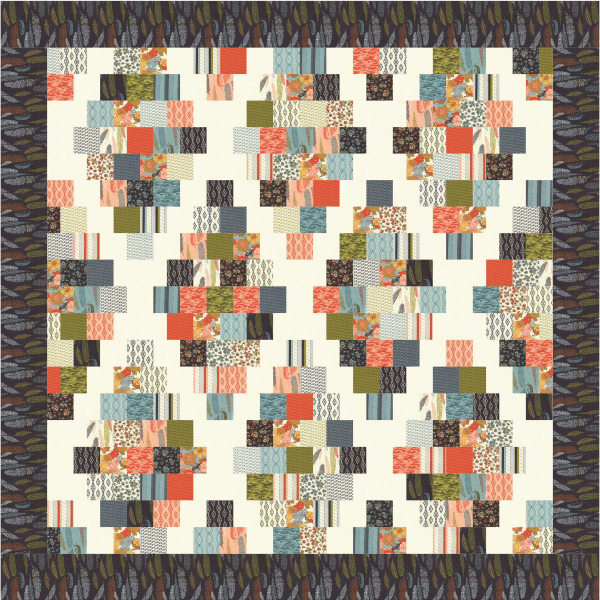 I would love to win this quilt kit. Thank you for the giveaway. What a lovely giveaway! The quilt colors and furniture shown speak to me. Thanks for the chance. Love the mixed/scrappy look with the pops of color. Thank you for the opportunity to win! Love it. I love farmhouse style, especially Swedish farmhouse style! Classic and lovely and utilitarian! Oh I love this farmhouse quilt!